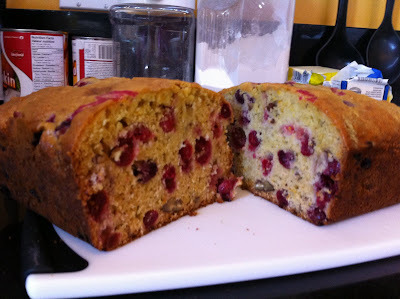 I usually make a triple batch of the recipe because it is so yummy and because the bag of cranberries usually is enough to make more than one batch. I also could not find fresh cranberries so I used frozen unsweetened cranberries and found that it worked just like normal. 3. 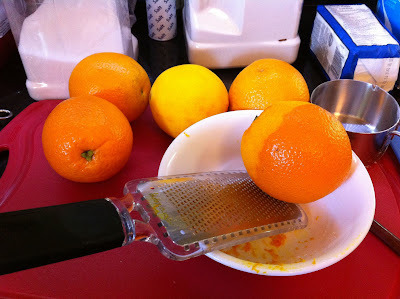 First thing I do is zest my oranges. 4. Whisk together flour, baking powder, baking soda, and salt. Stir in orange zest, cranberries, and pecans. Set aside. 5. 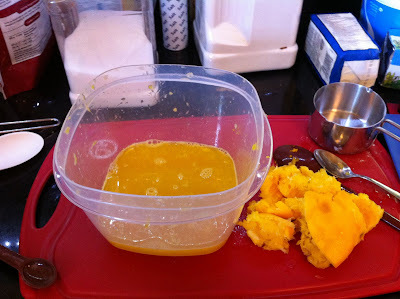 In a large bowl cream together margarine, sugar and egg until smooth. Stir in orange juice. Beat in flour mixture until just moistened. pour into prepared Pam. 6. Bake for 1 hour in the preheated oven, or until the bread springs back when lightly touched. 7. Let stand 10 minutes, then turn out Ono a wire rack to cool. 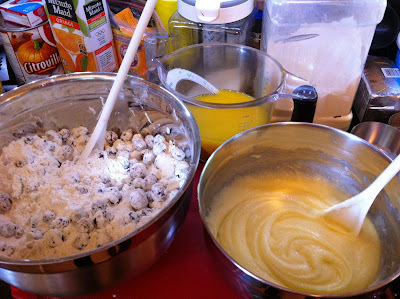 I usually don't care about mixing baking items separately (I know I know). However, in this recipe it is rather important to coat the cranberries evenly in flour before the loafs are baked to ensure that they stay properly in the mixture while baking. Also, given what it is being mixed the other components of the liquid mix are easier to mix together before adding to the flour mixture.